mugs – imagine how many they collect over the years? candles – not everyone is a candle person and not every candle is nice quality. scented lotions – scented items should be avoided because it’s such a personal preference. A lot of public places don’t allow people to wear perfumes and scents anymore due to allergies. Get to know your child’s teacher!! Put yourself in their shoes, select something that you’d want to receive. Don’t forget to include a gift receipt (if possible). Lunch Bag + 2. Beeswax Wrap – Most teachers bring their lunch to work because they’re usually in neighbourhoods and it’s too inconvenient to leave campus for a short period of time. Try getting a fun reusable lunch bag to carry their meals and snacks in. This particular lunch bag is great because it’s cotton canvas and has a water-resistant beeswax blend. It’s roomy, durable, and flexible. Pair this lunch bag with eco-friendly beeswax wraps to finish off the gift. 3. Letter Pendant Necklace – This might be considered an extravagant gift for a teacher but it’s totally awesome and works as a group gift from the whole class. Get everyone to throw in about $20 and select a class mom to go pick up the gift. I mean…what teacher wouldn’t want to open up a little blue box at the end of the year? Plus she has a sweet keepsake to remember the children. Tiffany’s has some beautiful pieces at a wide range of price points but I tend to gravitate towards anything monogrammed for a teacher. 4. Turkish Towels – I love multipurpose gifts and these Turkish towels are just that. They’re a cotton and bamboo blend and have many benefits such as being eco-friendly, highly absorbent, quick drying, lightweight, travel friendly, etc. They’re also totally fashionable and functional. It could be used as a blanket, shawl, towel, tapestry, cover-up, or scarf. This company is Canadian and they donate 1% of their profits to local non-profits that help protect wildlife and beaches on the west coast. 5. Gift Cards – Gift cards still might be my most favourite gift – ever!! It’s guilt-free spending to your favourite shop…who wouldn’t love it? I have a couple ideas when it comes to selecting gift cards for teachers. You could either go the personal route or the classroom supplies route, and either one would be very appreciated. Get a personal gift card for the teacher to a great spa, restaurant, mall, local coffee shop, book store, or even their favourite hair salon. Did you know that teachers spend hundreds of dollars out-of-pocket every year just to make their classroom cozy and enjoyable so your child can have a great experience? Try getting them a gift card that they can use towards supplies for their classroom. Get a gift card for classroom supplies – Amazon, the Dollar Store, Walmart. 6. Everywhere Kit – This everywhere kit would be good for personal items like makeup and skincare or it could work as a pencil case. I like that it has a wire zip opening making it easy to access and spot items. 7. Fruit Infuser Water Bottle – You can never have too many water bottles, but what I love about this one is that you can infuse fruit into your water. Perfect on a hot summer day. It’s durable, holds 32 oz, BPA-free, and dishwasher safe. You can also find it on Amazon.ca. 8. Twill Zip Tote or The Day Market Tote – Teachers always have lots of paperwork to carry with them back and forth so why not get them a stylish bag to put it all in! These would be my two picks from Everlane at very different price points. 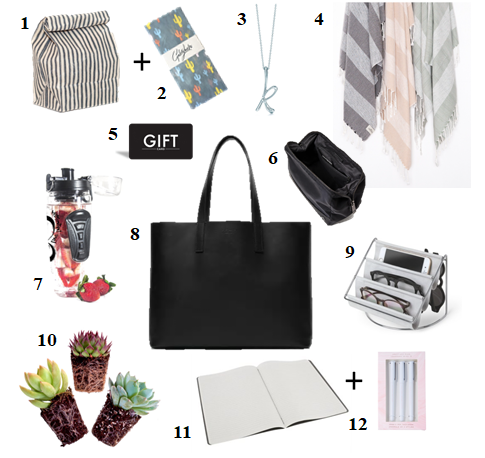 The more expensive leather tote would work as a fun group gift turned gift basket where you fill it with a few things like a notebook, pens, magazine, book, water bottle, $15 gift card to a coffee shop, etc. 9. Accessory Organizer – Teachers love to stay organized and this accessory would be perfect for their desk or to slip in a drawer. 10. Plant – A potted plant is always nice gesture and a little longer lasting than flowers. It can really bring life to the classroom or a teacher’s home. You could try purchasing a plant that’s low maintenance like succulents or airplants. Or, you could try a tropical plant that’s good for air purifying. For a wide variety of options, check out Plant in Inglewood, Calgary. 11. Notebook + 12. Pen Pack – Buying a nice quality notebook is a very useful gift because they can use it as a journal or for planning or even meetings. Pair a notebook with a nice set of pens to round out the gift. And, just a reminder, teacher’s don’t expect gifts but a little something sure goes a long way. You could even have your child help in the selection process and attach a homemade card with whatever gift you choose. Let me know which item is your favourite in the comments below. Next May: What’s in my cart?